Watch this video to learn about the dangers of ingesting lithium button batteries and what to do if you think your child swallowed a battery. The Children's Education Program at Children's Hospital of Philadelphia's Poison Control Center teaches children how to avoid accidental poisonings. Be sure to keep e-cigarette liquid refills out of the reach of children. These products typically contain nicotine as a primary active ingredient, which may cause nausea, vomiting, dizziness, excess saliva, tearing, diarrhea and muscle weakness if swallowed. Get regular updates on poison prevention tips, medication safety, environmental safety and other current trends. 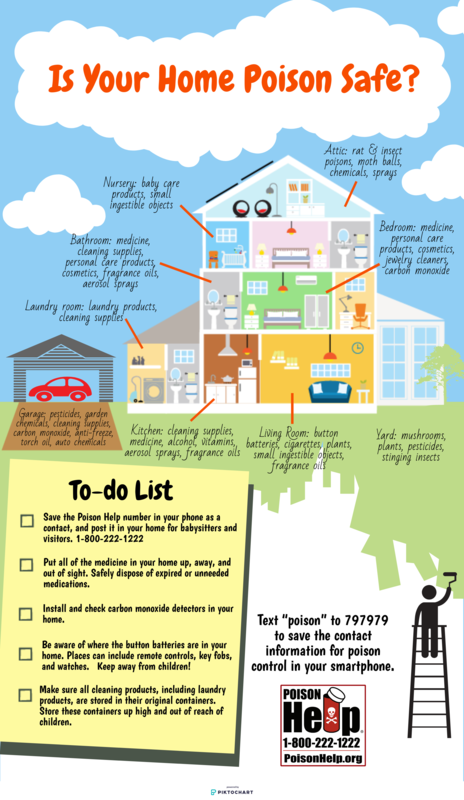 Here are some ways you can help keep your family, friends, and yourself poison-safe at home. In celebration of National Poison Prevention Week (NPPW), March 18 - 24, 2018, individuals, organizations, and institutions around the country will come together to raise poison prevention awareness and advocate for the nation’s poison control system. Opioid addiction is a national crisis that continues to devastate Philadelphia and its surrounding counties. If you or someone you know is struggling with opioid addiction, find a list of available resources that can help. Use this home safety checklist from the Poison Control Center at Children's Hospital of Philadelphia to learn which products you should keep out of your child's reach. CHOP’s Poison Control Center has developed a Home Safety Checklist that can help you find out if your home is "poison proof." Poisonings and medicine mishaps can happen to anyone, regardless of age. While approximately half of the cases managed by poison centers in 2016 involved children, many of the more serious poisoning cases involved teens, adults, and older adults. By taking a few precautions, you can help kee you and your loved ones of any age poison-safe! Information on safer alternatives to common hazardous household products from the Poison Control Center at The Children's Hospital of Philadelphia. Stay safe this summer with poisoning prevention tips from the Poison Control Center at Children’s Hospital of Philadelphia. These resources explain what lithium batteries are, how common they are in household items, how dangerous they can be if swallowed, and what symptoms your child may display if he swallows one. Poison Centers are NOT just for parents and children! Poisonings and medicine mishaps can happen to anyone, anywhere and anytime. Here are some reasons older adults should call their local poison center. This illustrated booklet helps young children learn about poison safety through the story of Tommy and Aliva's visit to their grandparent's house. This 18 page activity and game book teaches kids in a fun and engaging way how to be poison safe. Poisons are everywhere and kids need to learn how to avoid them. This handout includes information on medications and household products, and tips to prevent poisonings. This resource offers outlines and activities that educators can use to help protect children from poisonings. Polyethylene Glycol Laxatives: Are They Safe for a Child with Constipation? This resource addresses the safety of PEG 3350 laxatives, such as Miralax®, and offers recommendations for their safe use in children. This brochure teaches families how to remove toxins from the home and make their homes safer and greener. Keep your family safe by cleaning out your medicines. Has a bottle expired? No longer in use? It’s time to toss. Download our resource for a checklist to stay on track and to learn about safe disposal options. This fact sheet highlights the dangers of opioid medications, guidelines for use, safe disposal, and alternative treatments for pain. The Agency for Toxic Substances & Disease Registry (ATSDR):Tox FAQs and Toxicological Profiles is a database of chemicals, their uses and their toxicological profiles. The American Association of Poison Control Centers supports the nation’s 55 poison centers in their efforts to prevent and treat poison exposures. The American College of Medical Toxicology (ACMT) is a professional, nonprofit association for physicians with an interest in toxicology training and education. The CDC is dedicated to protecting health and promoting quality of life through the prevention and control of disease, injury and disability. Visit the Food and Drug Administration for information on recalls, warnings, and educational material on food and drugs. To report an adverse event to a medication or dietary supplement, visit Medwatch: The FDA Adverse Event Reporting System. Find environmental health resources for children using the Pediatric Environmental Health Specialty Units' fact sheets, webinars and courses, and network of experts.